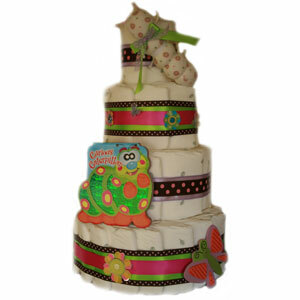 Welcoming the arrival of spring and summer becomes a delight with the Organic "Curious Caterpillar" Diaper Cake. Crafted with 4 layers of Nature BabyCare Diapers and loaded with baby essentials, this diaper cake makes a perfect baby gift for a mom awaiting a baby girl. Decorate a baby shower with this stunning baby shower centerpiece or bring along with you when visiting the new mommy in the hospital. This unique baby gift will be one a new parent will always remember. We also take special care to ensure ALL of the diapers are usable by the new mommy.